The Battle of Messines in Belgium began at 3.10am on June 7th 1917 with the explosion of 19 massive mines. The simultaneous explosions were heard across Europe and even rattled the teacups in Downing Street! This year marks the 100th anniversary of the battle, when a wreath will be laid on behalf of the Passchendaele Society at 8.00am in the New Zealand National Commemoration at Messines Ridge British Cemetery by members MaryAnn & Colin Mann…MaryAnn’s Grandfather fought at Messines. The missing in action from the Battle of La Basse-Ville (Belgium) and other battles of that period, are also commemorated on the New Zealand Memorial to the Missing at Messines. After Messines, the New Zealanders were moved to defend the area around the nearby village of La Basse-Ville from June until August 1917 before moving off to the Passchendaele area. A recap on the history – while the New Zealanders defended the area just north of Armentieres, hard-working British and Australian tunnellers were digging and preparing 24 massive mines under the German-lines, under the Messines Ridge. Some of the mines were laid and prepared months in advance, but every day the lines had to be checked and the explosives kept dry. One mine was discovered by the Germans so they mounted a counter-mining attack. Another mine was abandoned due to a tunnel collapse and four under the Ploegsteert Wood were not detonated on 7th June as they were no longer under the German frontline – one of these exploded after being struck by lightning in 1955! The ship “Mathilde Maersk” with the New Zealand-sourced items for the Memorial & Garden (bronze discs, basalt pavers, etc) in 5 containers onboard arrived on May 5th in Antwerp, Belgium. Photos of the ship’s arrival and progress reports are on our website http://passchendaelesociety.org/memorial-garden/ . The containers have now been unloaded, cleared Customs and transported to Zonnebeke. Cathy Challinor from Boffa Miskell will be particularly interested in the Australian connection with the ship’s name – ‘Mathilde’ – the Flemish version of ‘Matilda’ who is the present Queen of Belgium. So our containers went waltzing with Matilda as in the well -known Australian song. Warwick from Jagas Paving will be on site at Zonnebeke for the week commencing 24th May to supervise the installation of the NZ-sourced paving (both the Timaru Basalt & the pre-cast Maungaturoto Aggregate paving segments). He will also oversee the laying by our Belgian contractors of the in-situ constructed paving which will incorporate the stocks of loose Maungaturoto aggregate we shipped to Belgium. The New Zealand Memorial & Garden – Nga Pua Mahara (which means Petals of Remembrance). is being created in remembrance of the more than 5,000 New Zealanders who were killed or mortally wounded in Flanders, Belgium. Most still lie in the surrounding Flanders Fields, others made it over the border of France only to die at a later date in a Field Dressing Station or hospital and are thus buried in French soil. The ‘darkest day’ in New Zealand’s military history is specifically incorporated in the Memorial & Garden design commemorating the 12th October 1917 attack on Bellevue Spur. The holes penetrating the remembrance column represent the more than 2,700 casualties at the end of the day including wounded, dead and missing. The dead are represented by the 846 bronze discs inset in the paving. The scattering of the discs and the random array of the penetrations symbolize the chaos of war and its impact on the lives of so many. The New Zealand Memorial & Garden will be in the Memorial Park next door to the Passchendaele Museum, in the grounds of the Zonnebeke Chateau. Also included in the shipment was a bucket of freshly dug soil taken from the site of the new Belgian Memorial to be built at the Pukeahu National War Memorial Park in Wellington. As the 5,000 soldiers that still lie in Flanders Fields can never return to home soil, the soil will be taken to Flanders. “Provide me with a handful of soil from my homeland so I may feel the warmth of my ancestors and weep”. Many New Zealanders are unable to make the journey themselves to Belgium now or even in the future. It is therefore our intention to create a documentary from start to finish to tell the story of the Memorial & Garden, subject to funds being raised. It is our hope that it will be shown in schools, museums and libraries across New Zealand for many years to come, thus keeping very much alive the memory and history of what went on in Belgium for generations to come. As well as being broadcast nationally the documentary would be available to the general public free of charge from the Society’s website, the WW100 website and other official sites. 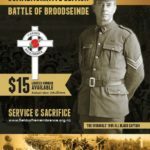 The Passchendaele Society’s Give-a-little page is where you can donate to this worthy project, here is the link https://givealittle.co.nz/org/passchsoc1. All future donations received will go towards the cost of making and editing this documentary. We wish to take the opportunity of thanking the following for their contributions and support towards this significant project: ANZ Bank, Student Horizons and the Fields of Remembrance Trust. However, with unforeseen additional costs (such as the Min. Ed chaperones and the bus driver’s accommodation costs in Europe) there is a current shortfall of $6-8,000 on the budget, so another sponsor is being sought. Please let the Passchendaele Society Secretary know if you have anyone in mind that could be approached for funding. There is also a second competition organised by the Veteran’s Affairs. It is a multimedia competition with the intention of “encouraging young people to learn more about New Zealand’s First World War history and also to reflect on how we remember the sacrifice that took place in the fields of Belgium 100 years ago”. As in past years the winning Year 13 student will receive $2,000 education contribution, and in addition this year’s winner and runner-up will travel to Belgium to attend the Battle of Passchendaele centenary commemoration as part of the New Zealand Defence Force Youth Ambassador programme, together with the winner and runner-up from 2016. Hence the dates of this year’s competition have been brought forward so that the winners can be found earlier than in previous years. This year also sees a special year 12 speech writing category, to mark the centenary. The winner will represent New Zealand youth and will read their winning entry at the national commemorative ceremony at Pukeahu National War Memorial Park in Wellington. The Belgians Have Not Forgotten Touring Exhibition is coming to Auckland on the 8th June. Members are invited to attend the opening at 6pm at TS Achilles, The Navy League, 19 Tamaki Drive, Orakei, Auckland. Herb Farrant would very much welcome volunteers to assist in whatever way you can offer during the period that the exhibition is held here in Auckland. You can contact Herb via email on: herb@pcis.co.nz; tel 09-306-7791; cell 027-490-9529. If you are in the Waikato, you can see the exhibition until May 28th in the Waikato Museum. After Auckland, the exhibition will then move off to Wellington (July/August at the National War Memorial, Taranaki Street); Christchurch (August/September at the Air Force Museum, 45 Harvard Ave, Wigram, Christchurch) and at Dunedin (22nd September/November in the Toitu Otago Settlers’ Museum). The Passchendaele Society commemorates all those that lost their lives on the Western Front. Here in Auckland we are of course holding our own annual commemoration on October 12th at the Auckland War Memorial Museum. However as it is the 100th anniversary it will be a much larger event. Details are still being finalised but the plans so far are a pre-commemoration ceremony in the Auckland Domain for the opening of the Field of Remembrance which will contain 2471 crosses installed by the Fields of Remembrance Trust to commemorate the New Zealand lives lost in the Passchendaele Offensive. We will then all make our way indoors to the Hall of Memories for the ceremony starting at 11.00am. Afterwards all attendees are invited for complimentary light refreshments served in the Events Centre upstairs at the Museum (12.15pm till 1.15pm). Later that evening a Centenary Commemoration Formal Dinner at the Northern Club will be hosted by the Auckland Officers’ Club and the Passchendaele Society. This Dinner will be run along the lines of a Formal Mess Dinner. Passchendaele Society Members are most welcome to attend. Details of timings, cost and guest speakers will be provided closer to the event. The New Zealand Embassy in Belgium is coordinating the October 12th 2017 events and the final programme will soon be announced. The ceremonies are intended primarily for New Zealanders and will not be ticketed. However, security will be tight so arriving early is advised. I have been told that it will not be possible to self-drive to Tyne Cot Cemetery, instead there will be a complimentary shuttle service put on by the local community departing from the Passchendaele Memorial Museum at Zonnebeke Chateau. Wood of Peace – one initiative you will have heard about is the planting of trees in the ‘Wood of Peace’ at Polygon Wood where a tree for every serviceman buried at Polygon Wood and Buttes New British Cemeteries is planned. Zonnebeke has reserved some 60-80 trees to be planted by New Zealanders at 4pm on October 12th and will involve VIPs, families and sponsors. One idea we’ve discussed with Zonnebeke is to work with the NZ Passchendaele Society to determine the best approach to plant/sponsor the planting of ‘NZ trees’. It may be that there are descendants who are unable to be in Flanders at the time but for whom we can plant a tree ‘on behalf of’. Freddy Declerck or Bob Davis can provide the number and names of New Zealanders buried at Polygon Wood and Buttes New British Cemeteries. This website is an excellent source to stay abreast of any developments in Zonnebeke/Passchendaele http://passchendaele2017.org/ Also the http://thebelgianshavenotforgotten.blogspot.co.nz/ is a great source of information. The 100-strong Auckland Choral Concert ‘In Flanders Fields – Passchendaele 100’ concert will be held at St Mathew-in-the-City, Auckland Sunday 28th May at 5.00pm. Tickets are still available via: https://www.eventfinda.co.nz/ or telephone 0800 111 999 ($45, concessions $38). A further concession is available to Passchendaele Society members – please mention code Choral17 when booking. Victory Medal, by Passchendaele Society member and New Zealand sculptor Helen Pollock, will be installed at Messines in time for the Centenary Commemorations for the Battle of Messines. It will remain there until December 2017.